Music has the power to motivate, move and inspire. From Mozart’s graceful melodies to Bob Marley’s breezy reggae beats, its emotive qualities enhance our health and wellbeing. But can music heal mental and physical suffering or help people with hearing loss listen better? improve the quality of life for dementia patients. This has led to an increased interest and participation in music therapy. Music therapy uses music to trigger emotional responses to relax or stimulate people or to help them communicate or heal. 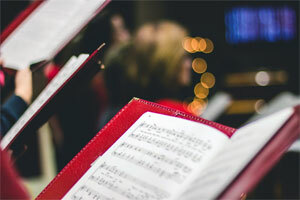 It is usually facilitated by registered music therapists who are often accomplished musicians. Research has shown it has positive effects on people with autism, stroke complications, dementia, depression and painful health problems. People involved in musical activities also appear to preserve speech listening skills better than others. Activities can involve singing, dancing, playing instruments, composing and creating. To hear conversations well in loud, busy places, it helps if you identify sound sources. Socially, it’s also important to understand the emotional state of the speaker, which is conveyed by pitch, tone and rhythm –also known as prosody. All these nuances contribute to hearing and understanding speech well in social spaces and gatherings. Combining auditory rehabilitation, cognitive training and music therapy can help a person with hearing loss achieve this goal. The relationship between music therapy and hearing loss is less well known. But a study by HEARing CRC Member Chi Yhun Lo (pictured right) , at Macquarie University’s Department of Linguistics (Sydney), has made some fascinating findings. “We wanted to see if music training benefits not just musical skills but also speech perception and social participation,” explains Chi, an audio engineer. His passion for music grew from working with the children’s band, the Hooley Dooleys. Chi launched a free, 12-week music therapy program for children with hearing loss with Nordoff-Robbins Music Therapy Australia, a not-for-profit organisation based at Western Sydney University. Seventeen children wearing hearing aids or cochlear implants, aged between six and nine years old, attended the sessions at Macquarie University’s speech and hearing clinic. Chi’s sessions involve weekly, face-to-face group music therapy sessions, homework with musical apps three times a week and test sessions tracking the children’s reactions to music and their speech perception abilities. “After 12 weeks of music training, the children’s speech-in-noise perception was improved by more than two decibels and their emotional prosody improved by more than 10 per cent,” explains Chi. This resonates with a recent Canadian study of six to 15-year-olds that supports the relationship between instrumental music training and improved speech prosody perception. It recommends using music training to support auditory rehabilitation after receiving cochlear implants. In earlier research, Chi discovered that adults with cochlear implants – who had once had normal hearing – were able to improve their ability to identify questions or statements after learning basic musical skills. 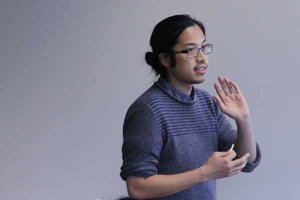 “I was looking at whether people could improve prosody, specifically being able to distinguish between questions and statements – where a question will have a rising intonation and a statement sounds flat or falls a bit,” explains Chi. Parents involved in the children’s program are singing its praises for the way it builds confidence, creativity, identity and listening skills. And the children clearly light up in classes. “I open the door to the clinic and the kids wave to me and run straight to the music room,” says Chi. “We try to leverage emotion and joy because when kids enjoy something they just learn it better,” he says. 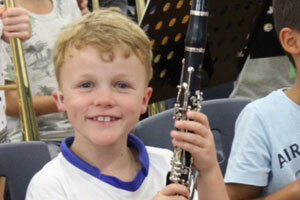 James with his beloved clarinet. Music therapy struck a positive chord with deaf schoolboy James Barker whose hearing issues improved after taking part in weekly sessions at Macquarie University’s speech and hearing clinic. James, eight, became profoundly deaf with sensorineural hearing loss after contracting pneumococcal meningitis at the age of eight months. He wears cochlear implants and attends a mainstream Catholic primary school where he is well supported. Using a microphone and sound technology he is able to boost his hearing skills in the classroom. His mum heard about the music classes on the Aussie Deaf Kids Facebook page and applied after James and his twin brother Thomas recently took up learning instruments. “The twins had started in the school choir and were learning the clarinet (James) and the trumpet (Thomas) so the timing couldn’t have been better,” says his mum Grainne. She adds the benefits of the program, a Macquarie University study, have been three-fold. They have boosted James’ confidence, his ability to identify certain tunes and hear what people are saying in noisy situations. “He really enjoyed being in a music class with other hearing impaired children,” says Grainne. “I definitely think that James’ speech perception has improved. He’s saying, ‘Pardon?’ and, ‘Could you repeat that please?’ much less often. “He is quicker to pick out tunes on the radio and has more melody to his voice. The progress that he has made in just three months is very impressive,” she says. This entry was posted	on Wednesday, August 2nd, 2017 at 11:54 pm	and is filed under News. You can follow any responses to this entry through the RSS 2.0 feed. Both comments and pings are currently closed.